Film review – Arrival (Denis Villeneuve, 2016) | Cinema, etc. For many cinema-goers, Arrival may have been one of the worst films of the year. For all its big-budget sci-fi overtones and its positioning alongside other space-based 2016 blockbusters such as Independence Day: Resurgence, Passengers and Rogue One, if you sought out Arrival expecting more of the same you may have been disappointed. Indeed, you will have been tricked into that much-elusive cinematic experience: thinking. 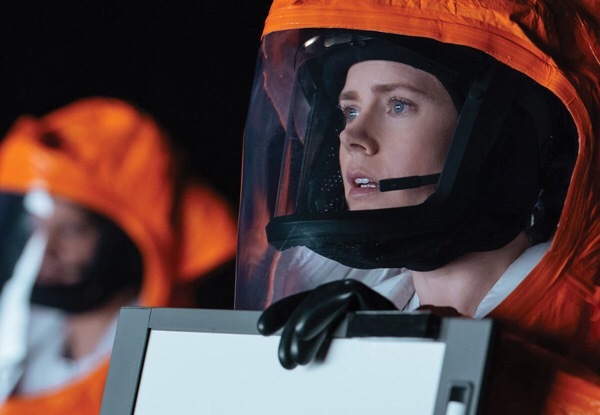 Set in modern-day USA, it stars Amy Adams as renowned linguist Louise Banks, brought in by the government to help humanity communicate with extra-terrestrial life forms that have mysteriously landed throughout Earth. She teams up with physicist Ian Donnelly (Jeremy Renner) to begin to decipher their language and understand why they have chosen now to begin communication. It is anything but a full-blown rollercoaster of action, instead concentrating its efforts on an elegant storyline with some seriously unsubtle political messaging. Or should that be serious and unsubtle? What screenwriter Eric Heisserer has set out to do – and succeeded – is position the viewers in the shoes of alien lifeforms understanding Earth for the first time. In that sense, we are asked to consider the absurdity of the fact that so many countries have ongoing conflicts, unable to get along with one-another. It may be set in the USA but you would be mistaken in thinking this was a lazy choice in making the Americans the saviours. The decision was more likely financial. Sure, the hero could have been from Pakistan or Chile, but this would have seriously hindered sales in the USA and all other countries where English is either a first or second language. Amy Adams, as always, puts in a brilliant turn as the determined linguist Louise. She’s a likeable and versatile actress, perhaps at the top of her game right now, and it is a crime that not one of her five Academy Award nominations has thus far earned her a win. Perhaps this year, with a potential double-nomination for this and Nocturnal Animals, we’ll see her rightly rewarded. Arrival is one of the best films of the year. Gripping, intelligent, thought-provoking and stylish. A must see.